Halloween means fun. Now, what sort of fun depends on your age. Parents will remember carving pumpkins, trick-or-treating, and party games from their childhood. They also want to share those memories with their kids. For the kids, Halloween means getting and eating as much candy as they can, and a chance to dress up as their favorite characters or play at being a ghost, goblin, or other ghoul. Teens, on the other hand, will be looking for mischief, or wholly focused on not looking dumb in their costume, or both. No matter what your age, a Halloween cruise guarantees a good time. Families will want to check out Disney Cruises on Halloween. During regular cruises, costumes are encouraged with pirate days, and pirate and princess parties for boys and girls respectively. Halloween on the High Seas is just Disney turning things up a notch. No one decorates like Disney. Starting in September cruisers on Disney ships will get the creeps from the pumpkin tree in the atrium, decorations throughout the ship, and creepy announcements over the speakers. Spider cake and spooky juice will be on offer as will activities like pumpkin carving and spooky stories. Returning this year is “A Nightmare Before Christmas—Sing and Scream” a 3D showing of the 1993 Tim Burton movie with guests encouraged to sing, and of course, scream along with the movie. The film will be followed with appearances by the characters Jack Skellington and Sally from the film. Disney calls the interactive experience 4D. Given the film’s lasting popularity with young adults the show alone may be enough to win over the most reluctant teenagers. During the entire cruise, the Lake Buena Vista theater will be playing a succession of scary movies. Parents meanwhile will want to head up a few decks for the “Halloween Isn’t Just for Kids” adults-only party. It promises dancing — possibly scary enough on its own — a costume contest, and a “villainous takeover of the dance floor,” which certainly sounds ominous. 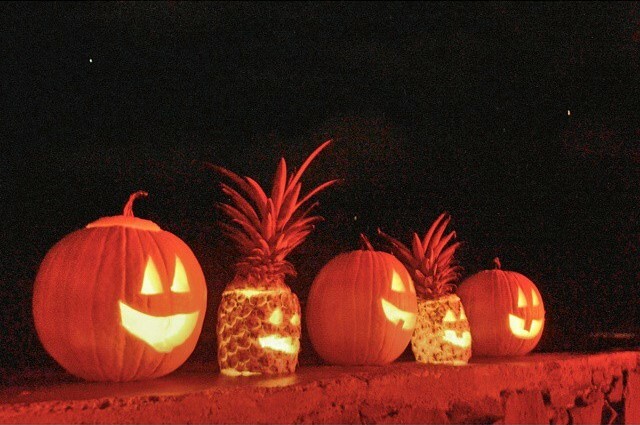 Other cruise lines do offer Halloween cruise-themed events and activities. They just don’t promote them in quite the same way that Disney does, nor does the holiday overtake the normal activities aboard ship to the same extent. This doesn’t mean they don’t celebrate Halloween, it’s more like Disney is that neighbor who goes all out with the decorations every year while other cruises content themselves with spider webs in the corners and paper ghost cut outs in the windows. Even so, a great cruise director can turn kitschy decorations into pure fun and, for passengers, a Halloween at sea can be something really special. Carnival Cruises offers “Frightfully Fun” Halloween-themed activities that come in between the usual shipboard activities on the “Fun Ships”. There are costume contests, trick-or-treat, and scary movies. Carnival makes sure to note that there are no masks allowed, nor are any props resembling weapons. No plastic pirate swords, no fake ninja stars, and especially no cowboy guns or Indiana Jones whips. It’s a prohibition that other cruise lines don’t mention, but one that should be considered if you’re planning to bring a costume aboard any cruise ship. If you’re planning to cruise this Halloween, you should make sure your costume is allowed. While missing your cruise due to security concerns, or getting yourself an appointment with a latex glove is horrifying, that isn’t really in keeping with the spirit of the season. A little digging on Royal Caribbean’s website reveals events from Halloween’s past that may be making a return this year. A video of a mash up of Thriller and Ramalam Bang Bang offers an exceptional live show that you may get to see if you’re taking to sea in late October. A gluten free Halloween cupcake recipe is available online, and the promise of classes in the cupcake shops aboard Allure, Oasis, Freedom and Liberty of the Seas is promised. There’s a costume contest, as well as “Howl at the Moon” and “Girl Scream” contests. Although details are sketchy on the latter two, but the titles are tantalizing, and if you have an especially effete scream, be confident because this is your time. Norwegian Cruise Lines offers treats like Transylvania Tea and Frankenberry martinis at the bar. Spiders made of dark chocolate, pecans, and caramel are a seasonal treat that will be on the menu. Also, the Norwegian Spirit sailing out of Port Canaveral is one of the ships in Norwegian’s fleet that offers a murder mystery lunch performed by the Second City Comedy Troupe. The mystery show is a regular feature of the cruise irrespective of the season, but it is especially appealing in late October. There are many reasons to take a cruise on Halloween, not the least of which is escaping the late October chill with a voyage to the tropics. A costume you wear aboard a ship sailing the Caribbean isn’t going to have to account for snow boots and a heavy winter coat. More than that it’s a chance to mark a much anticipated holiday that often passes barely noticed. If you asked yourself what you did for Halloween last year, the answer will likely be something along the lines of visiting a bar, going to a party at your office, or touring a few different parties held at a friend’s house. A cruise is really a succession of parties across multiple days that never entirely stops, and a Halloween cruise is a way to mark this highly anticipated but rarely satisfying holiday in a way you’ll remember for years. Editor’s note: A version of this article first appeared on Go Port Canaveral Official Travel Provider and has been republished here with permission by Go Port Canaveral.